Until this past year and a half that I have lived in south Louisiana I never got sick. I would be a stuffy nose, but nothing that needed much treatment. Since moving though I am pretty sure I am going to kill my liver with the allergy meds I have to constantly take. I'm from a long line of allergy sufferers, and this garbage doesn't seem like allergies. It appears to be more like burning cane field induced torment. In an effort to save my insides from the torment my sinuses put on my body I have become enthralled with homeopathic medicine. There is actually a doctor in Monroe who does just that, and maybe there would be one close to me...but I have yet to find one. When I do I am going to be all in. But hey, I've told y'all before...I'd be a hippie if I could convince the husband to jump on board. The foods we eat has a lot to do with our immunity, it's just part of that junk-in-junk-out idea. I eat like a health nut preparing for a nuclear meltdown that will force us all to eat processed junk that has been stored in our cellars since the cold war. Except those of us in Louisiana, cellars don't exist. You dig a few feet, and next thing you know you have an in ground swimming pool in your yard. Oh the beauty of being below sea level. 1) Nanny always swore by Vick's Vaporub. Thanks to her addiction, I too am addicted to the jelly. What we did with it includes everything the label said not to do. Primarily, she stuck it in her nose. I must admit, it works. Gets the smell right on in there! Recently I've started covering my feet in it and putting thick socks on before bed. I couldn't tell how well it was working, until I did it to my 2 yr old and almost 1 yr old nephews, it cleared them both up within 15 minutes. My new favorite Vick's idea is of course from Pinterest, you can put it in your Scentsy warmer with a teaspoon of water. I also have a camphor menthol mist, so I added a bit in there with it....my whole house now smells like Vick's. I love it, Jeremy keeps wondering when I will stop. 2) While I was completely skeptical at the time I read about taking a detox bath to clear toxins out of your body and primarily your skin. When I had come down with an awful cold a few weeks ago I did this several nights in a row and by the 2nd night I felt 100% better as I crawled out of the tub. From what I have read, with your skin is like a third kidney and you can release toxins by sweating them out. Taking a detox bath helps your body release these toxins. Soak in the bathtub for at least 20 minutes, and up to 40. To increasing sweating ground ginger can also be added. To increase the detox process you can add essential oils like tea tree oil or eucalyptus (20 drops). 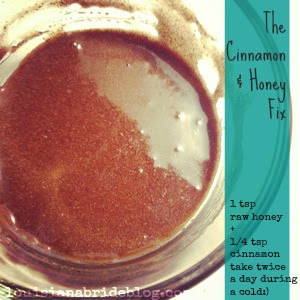 3) Taking cinnamon and honey for two - three days can nearly kick out a cold when taken twice a day. I'm guilt of taking it three times when I feel extra junky. Both honey and cinnamon are antiviral, anti fungal, and antibacterial. It also knocks out kidney & bladder infections, reduces sugar levels, blood pressure, and acts as a pain reliever for arthritis. 4) I can't remember where exactly I read it, but I've used cayenne pepper when I had head congestion or a sore throat for years. You simply mix 1 tsp of salt, with 8 oz of the hottest water you can stand to gargle, with as much cayenne pepper as you can stomach and gargle the whole 8 oz in several mouthfuls. It immediately numbs your throat and clears nasal passages. Cayenne is known as a pain reliever and anti-inflammatory agent that can relieve allergies. It is also know to help break up and move mucus from the body, which helps relieve cold and flu symptoms. Aside from just gargling cayenne pepper I also try to eat as much of it as possible for it's ability to detox the body and stimulate the circulatory system. I like to add it to soups, because let's face it, hot liquid makes sore throats feel better. If I don't feel up to making my own soup I will just add as much cayenne pepper as I can to those Lipton Cup-o-Soup packets. 5) My IRL friends that read this are going to think "There she goes again abut apple cider vinegar," but I promise this stuff works. I love using it for my skin, taking it orally and using it as an astringent will clear up acne. However, when you have a cold or sore throat coming on it helps to reduce sinus infections and sore throats. When you have a cold your body tends to become more alkine, taking ACV can help balance the body's acid levels. When using ACV you get the best results from Raw Unfiltered Organic Apple Cider Vinegar. The bottle I have right now is an organic raw brand from Rouses, when I run out I really want to see if there is a difference between it and Bragg. 6) Fire Cider: I found this a few weeks ago and am regretting that I haven't made any yet. As soon as we get home I am making a batch or two and seeing just how well it works. 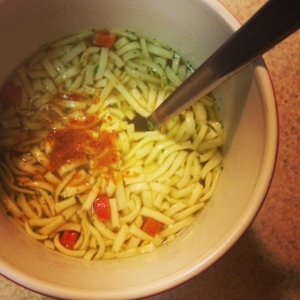 It is supposed to be a natural cold and flu remedy, click through the picture to get the recipe and see how it works. 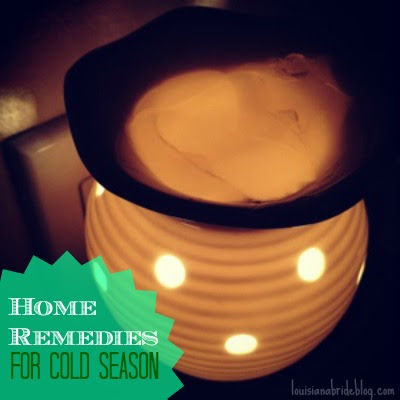 What are some of your favorite cold and flu remedies?